A PAIR of Bagenalstown designers are taking on the world of horology with the launch of their prestige watch range. 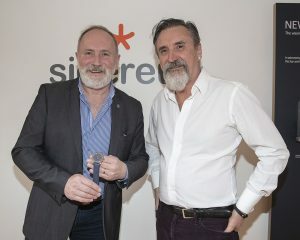 Product designers Bryan Leech and Martin Marley of Kilgraney House recently launched the inaugural range of their company Sidereus Watches. The Brú no Bóinne Collection range draws inspiration from the origin of horology and the marking of time in Ireland for more than 5,000 years. Bryan explained his long-standing love of watches dating back to his childhood. “I got my first mechanical watch when I was ten. It was the last present I received from my father. He died when I was 11 and it was always very important to me,” he said. Both Bryan and Martin have decades of experience in product design. The pair worked in Kilkenny Design back in the 1980s. Bryan has worked on a wide variety of designs, such as keyboards for Apple Computers, and he lectures at IT Carlow. Martin is a lecturer at the Institute of Art Design and Technology, while the pair have also run Kilgraney House for the last 25 years. Bryan got his inspiration for the collection after attending a conference which highlighted how Newgrange had marked time for 5,000 years. He made a one-off showpiece watch for a retrospective exhibition in 2015 but was encouraged by a friend and watchmaker to progress the idea. Bryan Leech and Martin Marley of Sidereus with one of the watches from their new collection. The watches pay homage to the megalithic structures at Newgrange, Knowth and Dowth. They are assembled in Ireland using modified Swiss-made parts. The designers say they wanted a contemporary timepiece that celebrated our ancestors’ contribution to the art and science of horology. The watch contains subtle references to the megalithic sites. The profile of the timepiece draws inspiration from the side elevation of Newgrange, while an orange second hand represents the light of the winter solstice sunrise. The watches themselves are mechanical and do not have a battery, relying on the movement of the wrist to wind it. The watches have a weight rotor at the back and you can see the movement through the exhibition window. It’s a special design. These are no ordinary watches and they certainly don’t come cheap, with prices starting at €2,800. Bryan highlighted the support from Carlow Local Enterprise Office in the endeavour. The two models have a variety of finishes and dials to choose from, each of which is limited to 50 pieces each, with the edition number engraved into each case back. Most watches will be sold on a made-to-order basis, but a small number may be available for purchase straightaway. There is an exhibition of the watch design in Kilgraney House, which will run until July, while the watches can be viewed by appointment.